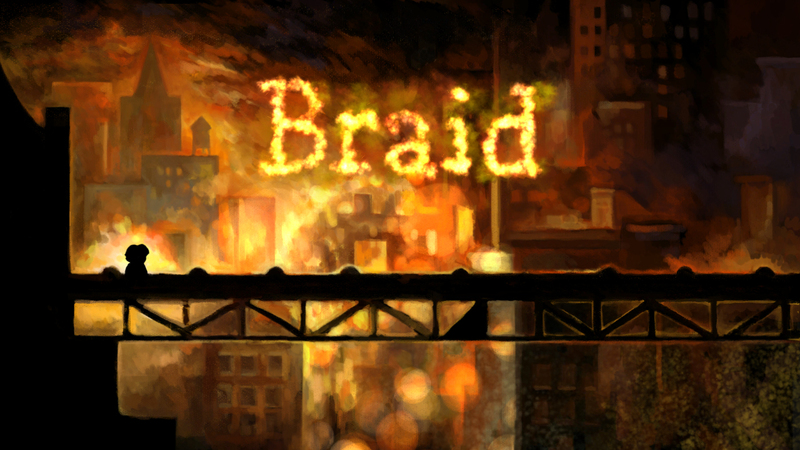 Braid is a downloadable platform game available on xbox 360. “Platform game” makes it sounds a lot simpler than it is; gameplay in Braid centers around time manipulation, the player can press and hold the x button at any time to rewind the action, this combines with other ways in which the time warps which the player has to manipulate in order to succeed. The plot fo briad involves a man called Tim who is on a quest to find the “Princess”, the princess is actually a metaphor for the nuclear bomb, and the themes of the levels explore the thoughts and ideas of a scientist so deeply involved in developing the bomb, such as regret and nostalgia for better times. This is evidenced in the final level, where if you manage to reach the visual princess, she simply explodes in a blinding white flash. It is also hinted at by exceprts of story, told in text via books on podiums. As you can tell from the decription, Braid is not your average game concept. It required a world to be built around metaphors and the human psyche. The artist on the game, David Hellman, has a page on his blog where he discusses some of the issues involving the creation of art for the game. David raises some important facts about the interaction of the player with the world and how this guides the art. Being aware of these player/world interactions allows for artists to excerpt a great deal of control on the way the world works and looks. Ordinarily, you’d imagine these to be the concerns of the Art director. However, as Braid was developed with only 2 people, the working rleationships will have different boundaries, and Hellman will of been an art director unto himself. So to speak. Generously, David supplies many art assets from the game for any and all to *use* and study. I’ll be using his animation cycles as great references If I begin to tackle some myself later in the year.